Last weekend, my wife had the idea for us to “ring the bell” for our local Salvation Army chapter. We also thought it would be a tangible way to teach our three year-old son about the meaning of Christmas. It was only a one-hour shift, so we felt certain that the allure of holiday service and charitable giving would keep his attention for sixty consecutive minutes. We were wrong. Once we explained to him that we might need to scale back the armed robbery vibe, he warmed up to the idea of constantly ringing a bell while “holding” the automatic sliding door for people. He was so adorable that customers started handing him their donations to place into the bucket. 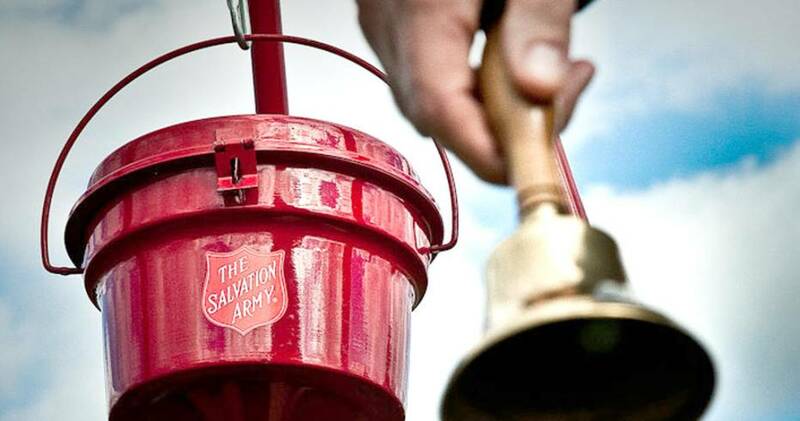 While this was well-intentioned, it broke one of the cardinal rules of Salvation Army bell-ringing: never touch the product. 2. Child frowns at crumpled bills in his hand and meticulously counts them while making no indication that he plans to do anything with the bills other than keep them. 6. Parent stops ringing their bell and reaches for child’s hand to “assist” them in depositing the money. 7. Child recoils / parent’s voice takes on a more threatening tone / customer is now visibly uncomfortable. 8. Parent wrestles money away from child, deposits money, and thanks the customer over child’s loud protestations. It was after this happened several times that I offered to place my son on my shoulders. This, I reasoned, would place him out of reach of most patrons and prevent a meltdown. The downside to this idea was that I was struck in the head several times by a metal bell and suffered some temporary hearing loss on my right side. Soon enough, the novelty of riding on shoulders wore off and he wanted to be posted at ground level again.